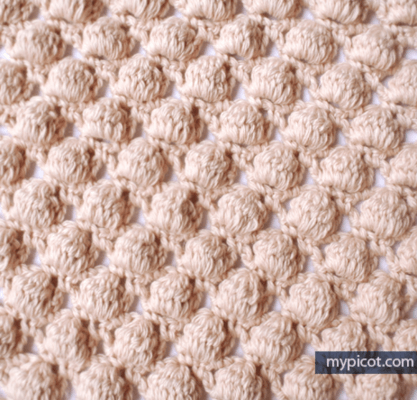 This crochet bobble stitch pattern tutorial will guide you, step by step, to make a great textured crochet blanket. That you just want to continually run your hands over. There are written instructions to follow, a downloadable PDF, plus a video tutorial. 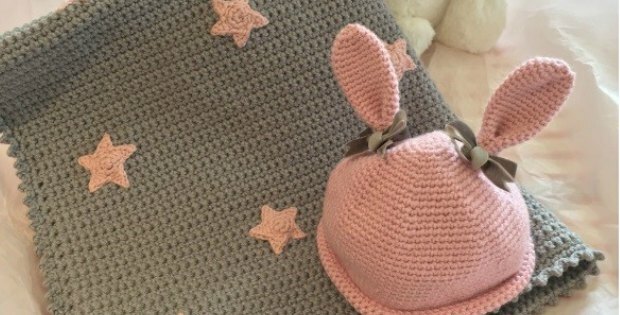 After watching, reading and looking at this stitch and dedicating some time to learning it, you will have another exquisite, versatile crochet stitch under you belt. The past few weeks I’ve taken my favorite pastime to a whole other level. Usually, I crochet to pass the time and to try some new exciting patterns I might have seen on Pinterest or elsewhere. Lately, though, I’ve been crocheting up like the fate of the world depended on it. Why you might ask, well it started out pretty much the same way it always does. I was looking at a bunch of yarn I had acquired at a garage sale a few days earlier thinking of all the crochet ideas I could try. Next thing you know, I’m whipping up a little crochet bobble stitch heart pot holder. I didn’t exactly have what you would call a sound plan, it just happened. That was the start of a handful of crochet pieces that I put together using this crochet stitch. I whipped up a couple of Afghans, blankets, table-top pieces and more. I have been a busy bee. Foundation Row: Chain an even number of stitches. Insert hook into the first chain stitch from your hook. Into each stitch, single crochet. At the end of the row, chain three. Turn. Insert hook into the first stitch from your hook to (begin a double crochet stitch. Yarn over and pull through. You should have four loops on your hook at this point. Next you will pull through the first two loops ONLY). Repeat () three more times into the same stitch. This creates your bobble. An easy way to keep track of how many double crochet stitches you have into one stitch is by the number of loops on your hook. When you have SIX loops on your hook, that tells you that you have enough double crochet stitches. To finish the bobble, you will pull all six loops through at once. Tighten the bobble by pulling on the yarn to really make it puff up. Into the next stitch you will work a single crochet. Then into the following stitch you will work another bobble stitch. Repeat this pattern throughout the rest of the row. This row will begin and end with bobble stitches. The bobbles will be facing away from you. Single crochet all the way through this row. Make sure you count your stitches. Begin by chaining one. Turn. Insert hook into first stitch and work one single crochet. Into the next stitch, work one bobble stitch. Then single crochet into the next stitch. Work a bobble stitch into the following stitch. The bobbles should fit in between the bobbles from the row you already worked. This row will begin and end with a single crochet. Additionally, you will have one less bobble stitch. Continue on in this fashion until your desired length. As might have imagined, this pretty Crochet Bobble Stitch makes any crochet project you under inherently beautiful and lots of fun to put together. 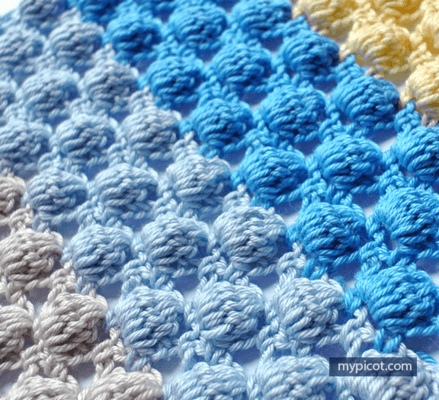 The texture of the finished item will make you want to keep crocheting more fun pieces. Then continually run your hands over them. What I like most about the crochet bobble stitch pieces I created, is that they have some great texture but are not too heavy. The stitch allows gaps in between the bobbles giving it a lacy look. The lightweight stitching balances out the heavier weight of the bobbles. You can use this stitch to come up with your own patterns for cowls, scarves, hats, and gorgeous baby blankets. Also referred to as a cluster stitch. 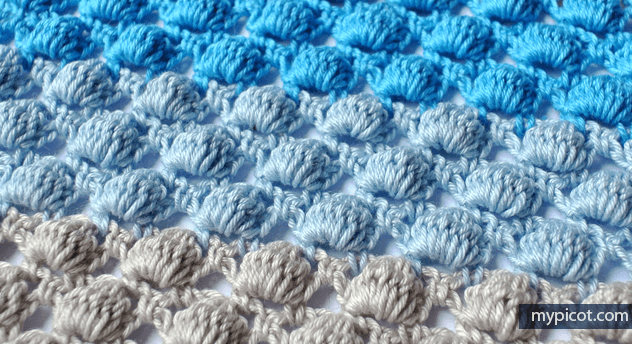 There are many variations of the crochet bobble stitch, but once you understand the basic principles, it won’t matter if a pattern you’re working on requires three, five or seven dc’s in each bobble. The principle remains unchanged. Yarn in varying colors. Choose colors that to go well together. A large crochet hook, preferably a U.S size K/10.5 or 6.5mm. For most projects, my crocheting buddies insist on using bobble stitches that contain three dc’s. However, as I mentioned, there are no limitations when using the crochet bobble stitch as long as you understand the basics. On the same, it is worth noting that you cannot make these bobbles too close to each other. Now, you might be wondering what to crochet next using this pattern. Why not surprise your friends at work with some colorful cowls and scarfs? Better yet, invite a couple of friends over and crochet up random pieces using this pattern as part of a challenge? However while the tutorials are excellent, sometimes the downloads are hard to find on the site. So at the bottom of this article you will find the link to the full step by step photo and written tutorial for the cluster bobble stitch. Also the link to download the stitch diagram to print and keep in your files or stitch reference book. 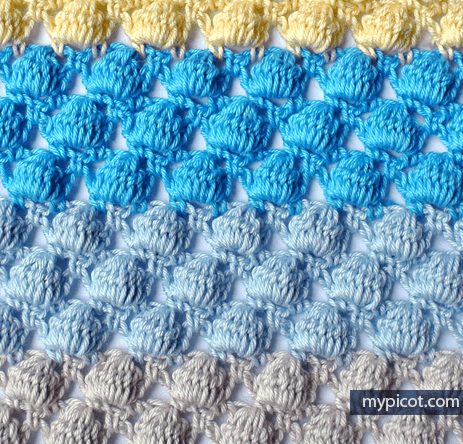 As far as the skill level is concerned, anyone can use the crochet bobble stitch to create stunning pieces. 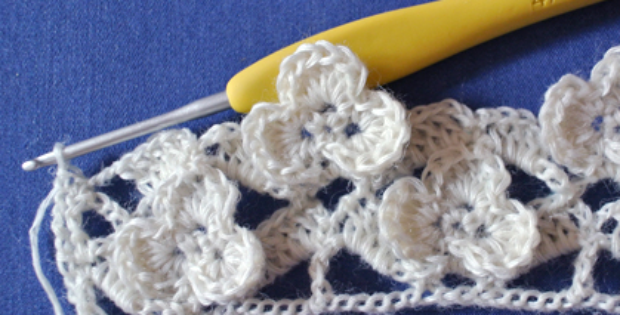 Beginners can use the instructional literature to avoid any mistakes while intermediate crocheters and the pros are good to go. There are lots of tutorial videos on this pattern on the account that it is wildly popular. I’m excited to continue my crocheting spree for a couple of days more. I can’t wait to show everyone my finished creations. I haven’t yet mentioned to my family what I am working on, wouldn’t be a surprise if I did would it? Anyways, a scarf for my teenage daughter, a warm blanket for myself, a couple of baby blankets for my sister in law and so on. If there ever were a crochet stitch I would insist you try; then the crochet bobble stitch would be it. Gather the materials you need and get to work on a couple of projects. You’re going to love it.